Nicole M. Camporeale is an attorney practicing with Floman DePaola, LLC. In 2017, Nicole was nominated by her peers and recognized New England Super Lawyers Rising Star after just two years of practicing law. She was admitted to the Connecticut bar in October of 2015 and the New Jersey bar in November of 2015. Prior to practicing with Floman DePaola, LLC as an attorney, Nicole worked at Floman DePaola as a Law Clerk beginning in May 2013. During this time, she became very familiar with our culture, our clients, our systems, and our practice areas. Nicole attended Quinnipiac University School of Law, graduating in 2015 with honors in the Family Law concentration. Prior to that, she attended Fairfield University, graduating in 2012 with a bachelor of Arts in Politics and concentrations in Studio Arts and Italian Studies. While at Fairfield University, she served as captain of their Division 1 Women’s Cross Country team. While at Quinnipiac, Nicole worked in the New Haven Superior Court through the Sappern Fellowship Program, providing assistance to pro-se parties filing temporary restraining orders and divorce paperwork. She also worked in the New Haven Probate Court drafting judicial opinions for Judge John Keyes, one of which was later published in the Quinnipiac Probate Law Journal. Nicole also received an award for Distinguished Academic Achievement in Trusts & Estates in 2014, an award presented by Quinnipiac to the student who receives the highest grade in the course for that semester..
Nicole enjoys working through the unique challenges that estate, special needs, and business planning pose. She feels her work at Floman DePaola provides a fast-paced, collaborative learning environment. 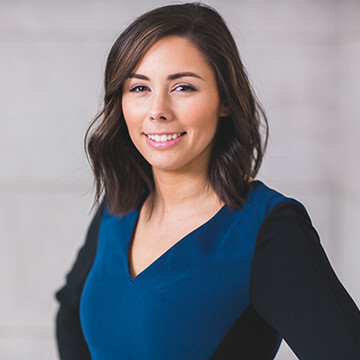 As an attorney passionate about helping clients form successful plans for the future, Nicole believes there is greater reward than when a client leaves satisfied, knowing their future wishes will be met. When she is not practicing law, you can find Nicole spending time with family, travelling with friends, taste testing local restaurants and running half marathons.